Kathmandu, September 1: Ms. Manisha Sthapit, programme assistant of Freshwater Action Network (FAN) Nepal has received research grant of Rs. 28,000 from Centre of Research on Energy, Environment and Water (CREEW) for the partial fulfilment of her Masters Degree in Environmental Management from School of Environmental Management and Sustainable Development (SchEMS) College. Ms. Manisha Sthapit will be conducting research on “The study on the estimation of Rainwater Harvesting potential in the housing colonies of Kathmandu District”. Ms. Sthapit informed that her research intends to estimate the potential of rainwater harvesting meeting the non potable water demand in the housing colonies of Kathmandu district. She further explained that the research will help to measure water demand in the housing colonies and assess the quantity of rainwater for non potable purpose. Kathmandu, September 2: Environment and Public Health Organization (ENPHO) has produced a TV Commercial (TVC) on Piyush and aired it through national TV channels such as Kantipur Television, Avenues Television and Nepal Television for one month. The new commercial intends to promote and popularize the brand Piyush among the general public as an effective means of household water disinfection. The new commercial features Jharana Thapa, a popular Kollywood actress and sanitation brand ambassador. ENPHO organized a gathering at ENPHO hall on September 2 to launch the TVC and get feedback from the audience. Chitwan, September 4: Representatives of Nepal Water for Health – Central & Western Regional Office, Bharatpur met with the committee of the Bharatpur Narayani Transportation Entrepreneurs on August 18, 2009 to raise awareness about sanitation among transportation entrepreneurs considering the problems of toilet use faced by transportation workers and passengers using the public transports and making such facilities easily accessible during their travel. Highlighting the objectives of the meeting, Mr. Bishnu Pokharel, PME Officer of NEWAH, Bharatpur said that sanitation is a subject of everyone's concern, and added that sensitivity shown towards sanitation especially by transportation workers who spend a lot of time in public places would hold great meaning. He also talked about sanitation promotion subject of mutual concern and responsibility. Mr. Bharat Adhikari, Communication Officer of NEWAH told that people from remote and marginalized areas, the poor, women, children including the transportation workers, footpath vendors and traffic police are the ones more vulnerable and victimized by the absence of sanitation facilities. “There is an urgent need to increase their access to the sanitation facilities,” he added. Pointing to the fact that long distance travelers especially women comparatively face greater problems, Ramji Baral, Chief Executive Officer of Bharatpur Municipality emphasized the necessity to construct public toilets in the bus stops, bus terminals and along the highway. Likewise, Hari Krishna Poudel, Division Engineer of the District Water Supply and Sanitation Division office said that sanitation is not an issue that can be solely dealt by a single person or an organization and it required participation from all strata in the society. Kathmandu, September 5: Society for Urban Poor (SOUP), an executive member of NGO Forum observed its 17th annual general assembly at Pachali Bhairav temple premises. Social auditing of SOUP’s activities in association with different organizations and communities in the last year was completed in the general assembly. Ms. Bijaya Raj Vaidya, secretary of SOUP presented the annual report. She highlighted on the programmes and activities of SOUP in the previous year. 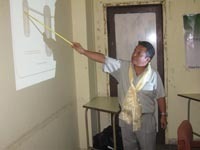 Similarly, Mr. Shree Krishna Maharjan, Treasurer, SOUP presented the financial report of the organization. Dhulikhel, September 7: A sanitation improvement programme is being carried out in Nala, Kavre using the household centered environmental sanitation (HCES) planning approach for the first time in Nepal. 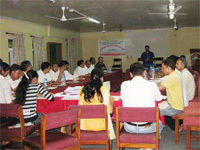 Constitution Assembly member Krishna Prasad Sapkota launched the programme on September 7, 2009 in Dhulikhel. Addressing the launching programme, Sapkota said that the developmental activities should be planned and implemented properly for sustainable development of Nala. He further added that the household centered sanitation programme will be the foundation of improving environmental sanitation in the village. Chief Technical Advisor of UN HABITAT, South Asian Region, Dr. Roshan Raj Shrestha emphasized the local residents of Nala to give top priority to the planning phase while preparing the sanitation plan. He opined that the locals should give up old tradition of planning and the households and communities should be placed at the center in addition to prioritizing infrastructural development. "Local people will be involved from planning to implementation phase of household centered environmental sanitation programme in Nala", said Padma Sunder Joshi, Executive Director of Center for Integrated Urban Development (CIUD). He told that most of programmes in Nepal fail to meet its objectives because the target groups are not given prime consideration at the time of planning. “The household centered environmental sanitation plan will be conducted in Nala in ten steps. The programme initiated in Nala is currently in its fifth stage,” said Mingma Gyalzen Sherpa of EAWAG who is coordinating and providing technical support to the HCES programme. The HCES approach is being implemented with technical and financial support of UN HABITAT and the Swiss Federal Institute of Aquatic Science and Technology (EAWAG) in partnership with CIUD and the Nala Integrated Development Committee at the local level. 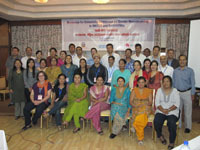 Kathmandu, September 12: Water and Energy Commission Secretariat (WECS) with support of UN HABITAT and Gender Water Alliance organized a three day workshop for enhancing awareness of gender mainstreaming in water and sanitation sector. Inaugurating the workshop, Mr. Chandra Singh Bhattarai, State Minister for Energy informed that the government of Nepal in its National Water Plan-2005 has given special priority to the issue of gender mainstreaming to ensure equal participation and access to water and sanitation. He added that the government has formulated short term, mid term and long term plans under the National Water Plan to extend drinking water facility throughout the country. Dr. Roshan Raj Shrestha, chief technical advisor of UN HABITAT South Asian Region opined that gender mainstreaming is not being given much priority in practice though the issue of women participation is generally raised as a hot topic for discussion. He stressed on the need of formulating women inclusive action plans in WATSAN sector and adoption of appropriate strategies for its effective implementation. The participants of the workshop made a common commitment to advocate ensuring gender balance at their organizations, and WATSAN sector. 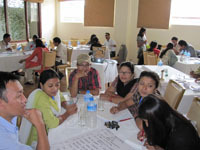 The workshop concluded with the decision to review the lessons and experiences of the operational aspects of these prepared action plans in follow up workshops, and the “Resource Book for Gender Mainstreaming in WATSAN Sector in Asia” will be prepared on the basis of these lessons and experience. Ms. Pramita Maharjan, Liaison Officer of NGO Forum told that the workshop has helped her to better understanding the value of gender mainstreaming and preparing action plan in the workplace. She further added that the workshop helped her to identify gender gap in workplace and workout for gender balance. Lalitpur, September 13: Urban Environment Management Society (UEMS) organized its 7th annual general assembly at the Administrative Staff College, Jawalakhel. Inaugurating the meeting, Mr. Barsha Man Pun, CA member praised UEMS for conducting many programmes for the conservation and protection of traditional water sources in Lalitpur. Mr. Dal Bahadur Singtan, executive director, UEMS presented the annual report of the organization. The AGM elected a new Board of Directors to serve from 2009 to 2011. The AGM re-elected Mr. Prem Singh Maharjan as President. Lalitpur, September 13: Urban Environment Management Society (UEMS) organized a dissemination workshop on the ongoing research “Implication of Harvested Rainwater in Recharging Shallow Groundwater Aquifer and its Quality” at the Administrative Staff College, Jawalakhel. Highlighting the objectives of the workshop, Mr. Suresh Das Shrestha, hydro-geologist told that the workshop intends to disseminate the achievements made so far by the research which was carried out in the core city areas including ward nos. 7, 8, 18, 19 and 20 of Lalitpur Sub-Metropolitan City. Mr. Shrestha presented on various recharge structures for recharging shallow ground water aquifer and the impacts shown by the research. He also talked about the impacts in terms of quantity of water recharged and quality of water changed/improved through this action research. The participants of the programme emphasized on the importance of such studies in order to address water shortage of the valley through traditional water sources. Lalitpur, September 14: A team from the Coca-Cola Company visited three communities – Chhusika, Chochen and Lonhala of the Lalitpur Sub-Metropolitan City— to assess the progress made by the “Partnership for Safe Water Campaign”, a unique private public partnership between Bottlers’ Nepal, UN HABITAT, Environment and Public Health Organization, Government of Nepal and Urban Environment Management Society ENPHO, Government of Nepal, local municipalities and community groups. 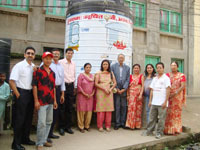 The three communities were declared as the Safe Water Zones for the first time in Nepal under the campaign. Waterborne diseases such as cholera, dysentery and diarrhoea were common in these communities in the past years. After the launching of "Partnership for Safe Water" campaign, public awareness on safe drinking water has been found remarkably increased in these communities. Nowadays, every household in the community practices household drinking water disinfection techniques. 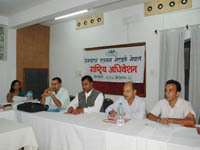 Biratnagar, September 16: Lumanti Support Group for Shelter organized a Media Orientation on Water and Sanitation Management Activities in Biratnagar to sensitize and encourage the journalists to write on the issues related to water and sanitation improvement activities held in Biratnagar. Highlighting the objectives of Media orientation programme, Mr. Puspa Raj Joshi, LUMANTI told that the orientation programme was organized to disseminate and aware the community about water, sanitation and hygiene improvement issues through media. He believed that the programme will provide platform to highlight the issues of citizens’ through media. Mr. Upendra Shakya, LUMANTI presented the water, sanitation and hygiene improvement activities carried out in Biratnagar. He highlighted on the micro finance and saving credit activities and it's achievements in Biratnagar. Explaining about water and sanitation services improvement effort in the city, Mr. Dilip Kumar Chapagain, Chief Executive Officer of Biratnagar Sub-Metropolitan City told that water, sanitation and hygiene activities has assisted to uplift the lifestyle of poor communities. Ms. Lajana Manandhar, Director, LUMANTI suggested the journalists to involve on research work for better understanding the issues. “Media should present the facts and monitor the activities as well as the process and budget of the project activities, she added. 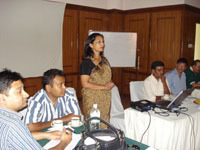 She appealed the journalists to assist for bringing out water and sanitation issues in media for wider public awareness. Mr. Dilli Prasai, secretary, Citizen Forum Biratnagar, presented an evaluation study of water and sanitation activities of various organizations working in Biratnagar Sub-Metropolitan City. Anil Sthapit, Director, Guthi described the role of journalists as well as media to disseminate water and sanitation issues in wider public. He explained the media activities held in Kathmandu and other cities; media orientation, exposure visits in communities, regular feedback and corresponding. He also presented some effort of journalists on water and sanitation issues and media coverage in national and local media. Mr. Mahendra Bista, former President of Nepal Federation of Journalists, suggested for provide the information of the water and sanitation to journalists for wider dissemination. He also suggested to the government and non-government official to keep a close relation with media. September 16, Itahari: Lumanti Support Group for Shelter organized a Media Orientation on Water, Sanitation and Hygiene Improvement Activities in Itahari to enhance the capacity of the journalists to identify the issues related to water, sanitation and hygiene activities. Speaking at the orientation programme, Mr. Puspa Raj Joshi from LUMANTI told that the orientation programme was organized to sensitize and encourage the journalists to write on the issues related to water, sanitation and hygiene improvement activities held in Itahari. Mr. Naresh Man Pradhan, LUMANTI highlighted on water, sanitation and hygiene improvement activities and micro finance, saving credit and income generating activities to be carried out in Itahari. Mr. Anil Sthapit, Director, Guthi told that media plays a pivotal role in generating awareness and educating people in the society. “This type of orientation programme will certainly enhance the capacity of the journalists to identify the issues related to water and sanitation activities,” he added. Mr. Tek Nath Sapkota, Community Development Officer at Itahari Municipality, explained about the present scenario of water, sanitation and hygiene condition of the municipality. He further explained the plan and programme of Itahari Municipality for water, sanitation and hygiene condition improvement. 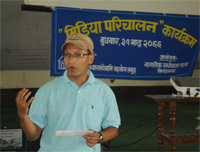 Mr. Sapkota highlighted on the proposed WASH programme, water and sanitation improvement activities and programme area. Kathmandu, September 20: NGO Forum for Urban Water and Sanitation observed its 4th annual general assembly in Kathmandu on September 20, 2009. The assembly nominated a new executive board of nine member organizations for the next four years. In the meeting, Mr. Prakash Mani Sharma, Executive Director of Pro-Public has been nominated as the president of the executive board unanimously. Similarly, Mr. Umesh Pandey, Director of NEWAH was nominated as the Vice-President of the board. Mr. Suman Kumar Shakya, Deputy Executive Director of ENPHO was nominated in the treasurer position of the board. Mr. Anil Sthapit, Director of Guthi was nominated as the Secretary and Mr. Ajay Mani Dixit, president of NWCF was nominated as the advisor in the board. Mr. Duman Thapa, President of MRMG was nominated the executive member of the board. Mr. Dal Bahadur Singtan, Executive Director of UEMS and Ms. Vidya Laxmi Shrestha, Programme Coordinator of SOUP were nominated in the executive board as the members. Newly elected President of NGOFUWS Mr. Prakash Mani Sharma expressed his commitments to take ahead the organization as in the past. He asked for the continuous support and advice from all the members and partners. Kathmandu, September 22: Kathmandu: Freshwater Action Network (FAN) Nepal organized its first national convention at the SAP Falcha programme hall in Babarmahal, Kathmandu. In the convention, FAN Nepal has formed a 13-member national committee in the coordination of Ms. Lajana Manandhar. Similarly, the convention nominated Mr. Anil Sthapit, Mr. Laxmi Kant Sharma, Mr. Madan Dangol, Mr. Rewat Bahadur Karki, Ms. Sabitra Wagle, Mr. Rajendra Aryal, Mr. Tukraj Sharma, Mr. Dhruba Dhital, Mr. Ratan Budhathoki, Mr. Kulmani Devkota and Mr. Prakash Bikram Shah in the national committee. Highlighting the objectives of FAN, Regional communication coordinator of FAN, Prakash Amatya explained FAN as an international network of WATSAN organizations from different countries throughout the world. “WATSAN organizations working at local and national level in Nepal are strongly advocating on WATSAN issues in associating with FAN since last two years,” he said. He believed that FAN could be an appropriate medium to raise WATSAN issues of South Asia Region at international level. Ratan Budhathoki, coordinator of Mid and Far Western Region of FAN told that FAN Nepal had played an important role by raising the voices of civil societies on WATSAN issues at third South Asian Conference on Sanitation (SACOSAN III) held in New Delhi. "FAN Nepal organized civil society consultation programmes at five development regions of the country and collected their opinion for this purpose", he said. Anil Sthapit, coordinator of Central Region said that FAN has provided a common platform for WATSAN organizations working at international, national and grass root level to act cordially for the improvement of WATSAN sector. FAN is an opportunity for WATSAN organizations to cooperate and support each other to conduct WATSAN activities effectively, he believed. Madan Krishna Dangol, former VDC chairman of Khokana and a FAN member said, “FAN Nepal has provided support for the development of Khokana. It has supported for the renovation of old wells, canals, ponds, and biogas plant.” A follow up meeting is going to be organized from November 9-11 in Srilanka to review the commitments and decisions made during SACOSAN III. 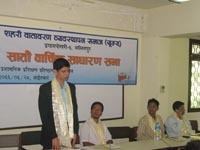 Kathmandu, September 25: GUTHI, executive member of NGO Forum, organized its 9th general annual meeting in Kathmandu. The assembly nominated a new executive board of nine members for the next three years. In the meeting, Mr. Maheshwor Shrestha was elected as the president, Mr. Rabin Sayami as Under Secretary, Ms. Laxmi Rajbhandari as Secretary and Mr. Deepak Bajracharya as Treasurer of the new executive board. Similarly, Mr. Pushkar Mathema, Dr. Nabees Man Singh, Mr. Arun Joshi, Mr. Devendra Shrestha and Ms. Bhawana Manandhar have been elected as the new members. Speaking at the programme, newly elected president Mr. Maheshor Shrestha told that the committee will coordinate with local people and conduct various service oriented and public sensitizing activities. He also expressed his commitment to continue GUTHI’s ongoing activities in future as well. He informed that the committee will soon draft an organizational action plan to implement social activities more effectively. Highlighting the activities conducted by GUTHI, Mr. Anil Sthapit, Director, GUTHI told that the organization has been running coaching classes for school students and regularly publishing a children's magazine "Pratyush" from very beginning to provide quality education to the children from poor families and communities. He also told that the organization has planned to conduct its media mainstreaming activities more effectively to raise public awareness on water, sanitation and hygiene. Congratulating the new committee members, former president of GUTHI and General Manager of Prime Commercial Bank Mr. Sanjeev Manandhar told that community should be financially upgraded to gain social development. He suggested the new committee to conduct income-generating activities to make communities financially capable.